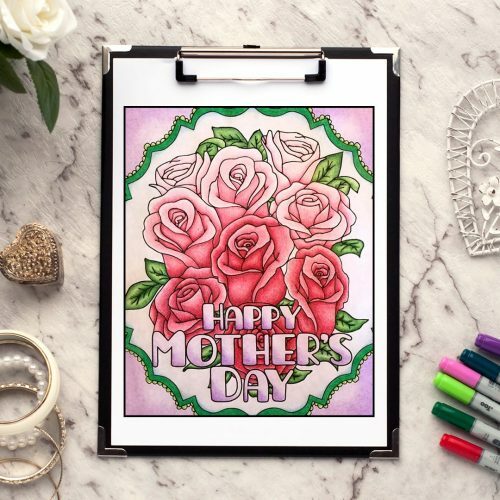 This printable Mother’s Day card is easy to make and fun to color in! 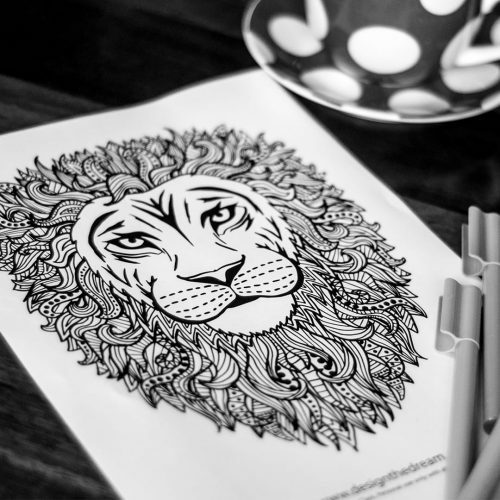 There are three versions included in this free download, including two colored printable cards and one that you can color in yourself. 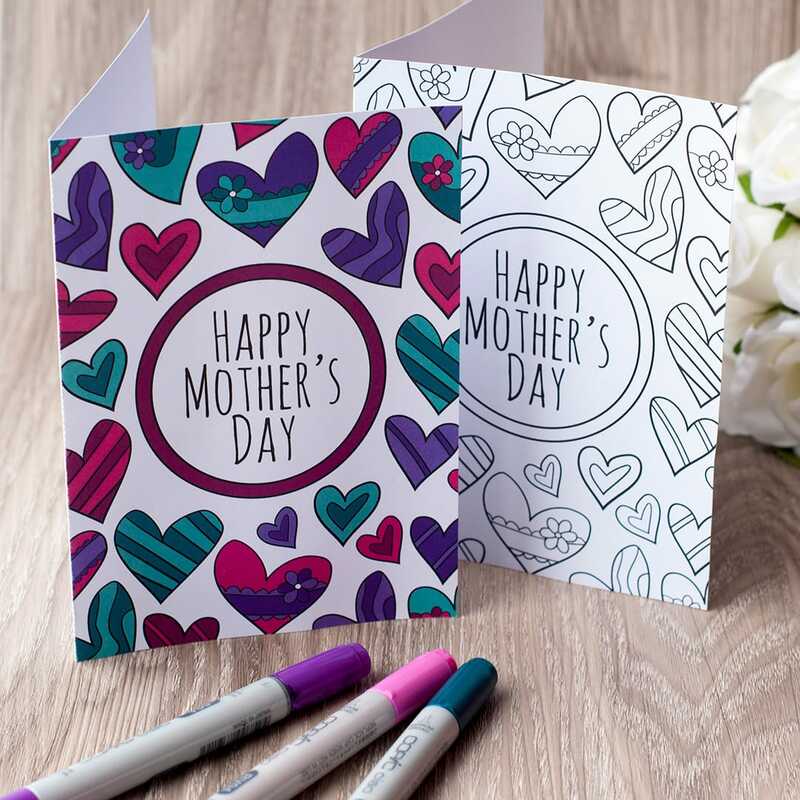 The card template prints on a standard letter size page (8.5 x 11″) and includes cut and fold lines. The final card folds to approximately 5 x 7″ You can scale the print to fit A4 printers or to print smaller cards if you prefer. 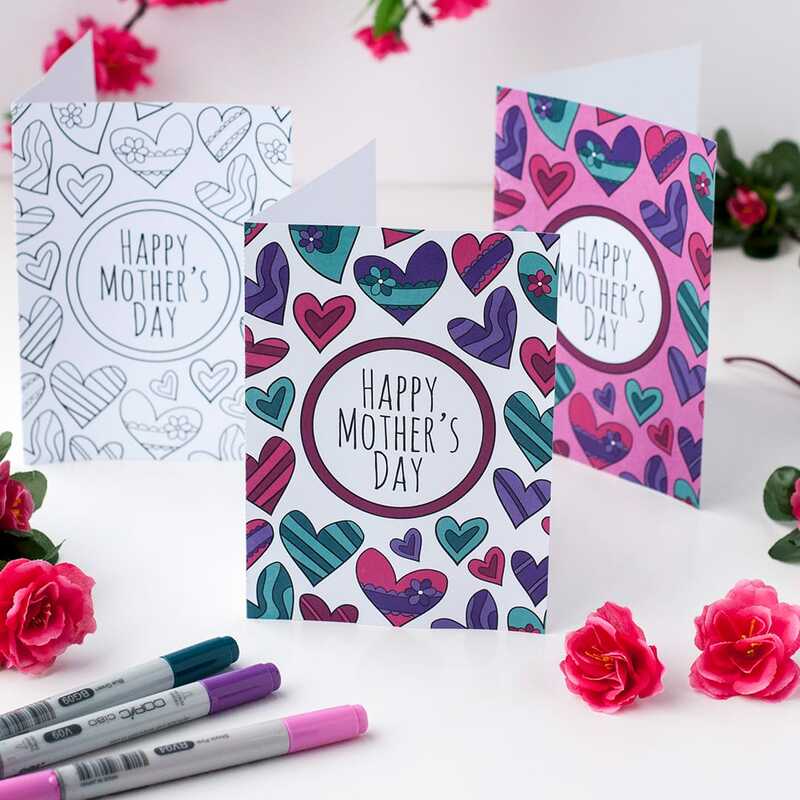 You can get the whole pack of 8 different Mother’s Day cards HERE. 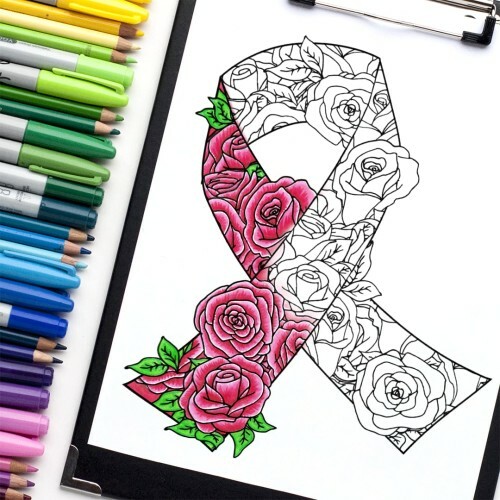 I colored this card myself, then added it to a larger card with ribbon & heart stickers = creating my own card with this one as part of the finished product. Will send to our d-in-law for mother’s day. I just love the beautiful designs offered, and how easy it is to navigate, and order, from the website. what better way to say happy mother’s day with a bunch of hearts. I got this free design before discovering I could get 7 more for $3.95. Cute design. Glad I got the 8 pack, too! Going to use with grandchild so he can give his mom a special card that comes from the heart. Coloured this on my iPad, printed out 6 copies for all the mums in my family. Used the same colours. Thanks Sarah. Sarah, thank you so much! I used the printable card you shared to let my students write some thank messages to their parents. So I changed “Mother” to “Parent” then we made it!! They seemed to be really exciting and enjoying when they were coloring on the card. Thank you so much again for giving us a great memorable time!! Very nice! My class loved them! Simple yet effective design. Beautiful work. Very cute! My niece and nephew loved it! My son and I loved it, it’s very simple but very nice to color and personalize it. Hope to get more like this in the future. I loved it! So easy to use and great for students to color in on their own! Love this mother day card! My students loved coloring this card to go with their presents. Loved all options, colored, partially colored and b&w! Love it, lots of fun. The cards were lovely. My only complaint would be having to cut the trim off each one as my grade 1’s would make a mess. A little time consuming cutting 20 cards. My students loved colouring the card. They turned out really great. Their moms are going to love them. It was very easily accessible and easy to download. 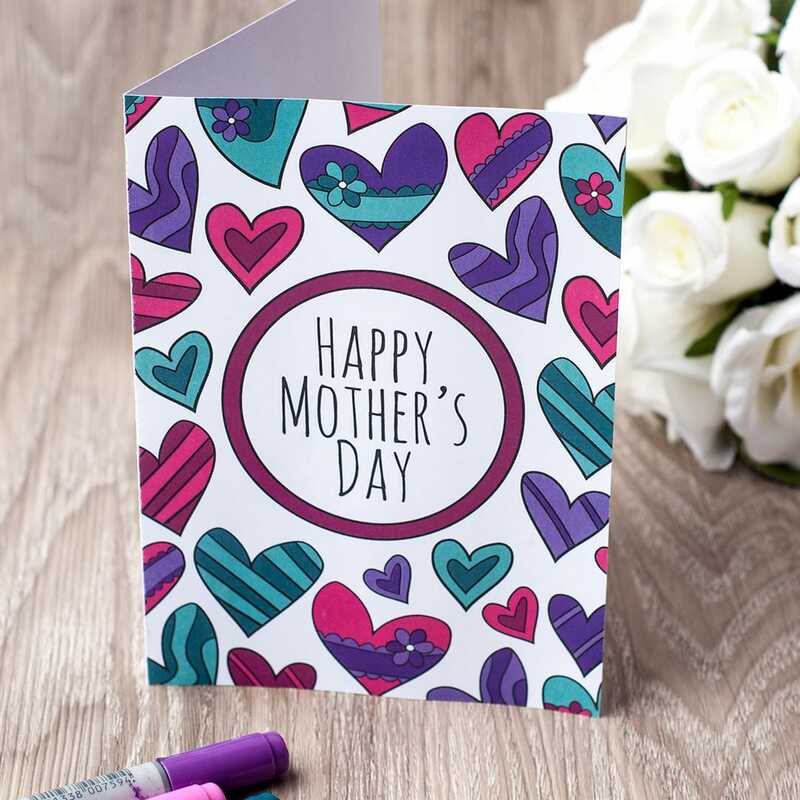 Thank you so much for providing such a nice Mother’s Day card free. Loved the art ! Used it with my students and they loved it. Would have been cool to have a version with a blank circle as I work at a French school and had to cut and paste the words in French. Love these cards! Just what I was looking for. We colored your cards for a Mother’s Day craft in a story time group I help lead. My mom is going to love this card. I felt like a kid again coloring it for her! Thanks for the free download! I got it fast and it was fun to do. I thought it was great and so did my mom which was the whole point. Thank u, and I hope u can come out with more free stuff like this I will defenetly try out. 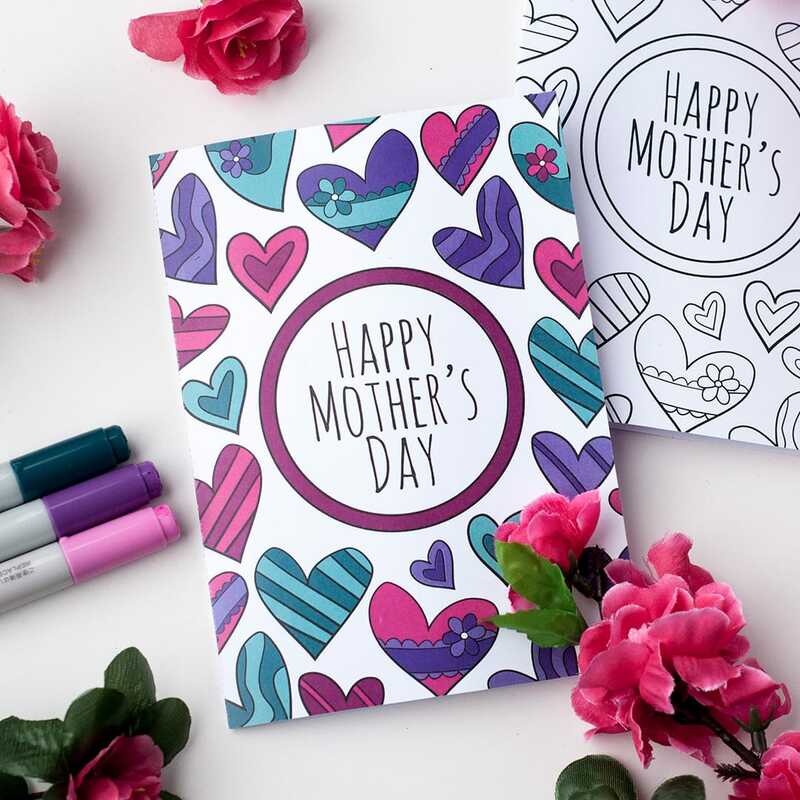 Perfect card to have kids decorate and write in for Mother’s Day! Saved me from my own failure to plan for Mother’s Day. Thank you! Easy, instant download. Really cute card! I Loved it and so did my daughters teacher! Thank you so much! Super easy and perfect for mothers day! I really love the mothers day card. Loved it! It was a perfect last min option for my daughter to color for my mom when I forgot that the next day was mother’s day! 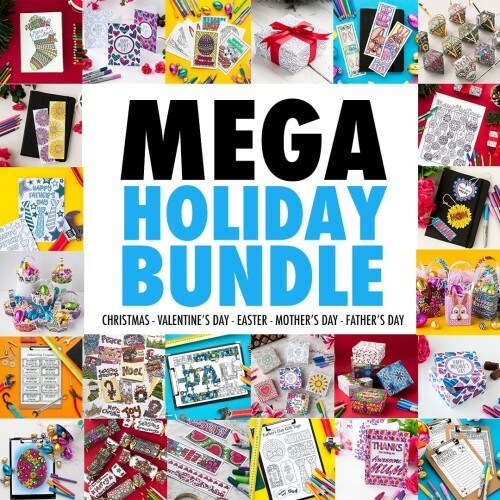 I was looking for something easy and quick to give to my mom and this was cheap and so cute! It was a very cute and useful card. I liked it a lot! I love doing these cards for special people and they always smile…………. Thank you for the free card. Would love to see an assortment of Birthday cards. Like the design an will be trying watercolours an Tombow markers on 2 cards. Printed them on card stock an they will go lovely with the Gift Box template which I’m planning on creating this weekend, we still have lots of snow, so its a good weekend project. Thanks you for the freebies, your creations are beautiful. Canadian Senior in snow belt country. I needed a colour in Mother’s Day card for the children to work on during the church service. The kids loved it! Thank you!